How this diesel safeguards heavy fuel economy: "Enterprise" diesels by Transamerica Delaval are designed like no others to live with the contaminants present in less expensive residual fuels. You don't have to trade the 10-30% potential savings in fuel for added maintenance cost. Our successful history in heavy fuel operation is becoming more important to ship operators coping with an era of cost- intensive energy. One reason why Transamerica Delaval can zero in on these often complex needs of customers is that we share with no one the responsibility for our diesels. Our own people design and build them; our own people support them from company parts distribution centers worldwide. Ave., Oakland, California 94621. Phone (415) 577-7400. Telex (47) 33-5304. Cable Enterfound. 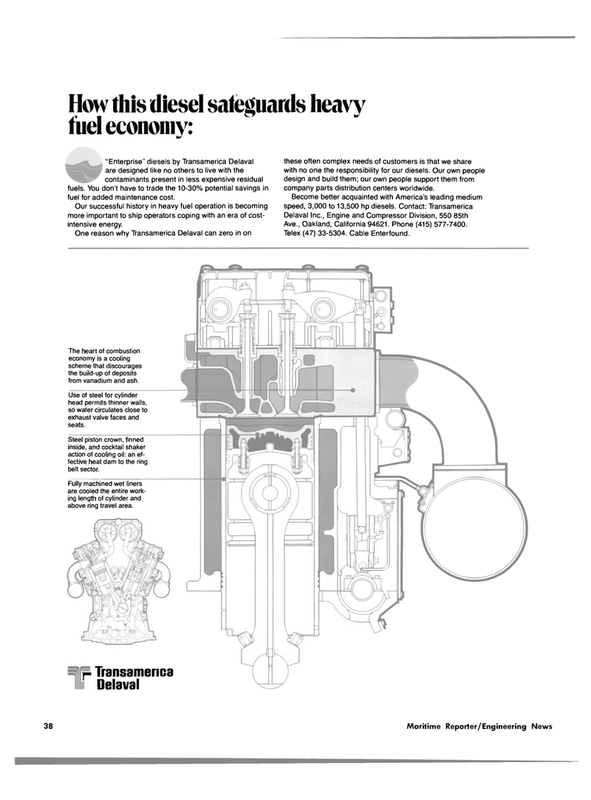 The heart of combustion economy is a cooling scheme that discourages the build-up of deposits from vanadium and ash. Use of steel for cylinder head permits thinner walls, so water circulates close to exhaust valve faces and seats. Steel piston crown, finned inside, and cocktail shaker action of cooling oil: an ef- fective heat dam to the ring belt sector. Fully machined wet liners are cooled the entire work- ing length of cylinder and above ring travel area.